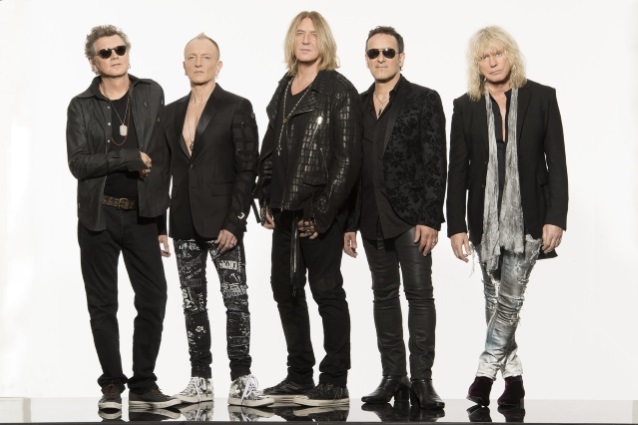 DEF LEPPARD singer Joe Elliott spoke about the band's Spotify session during a recent appearance on "The Eddie Trunk Podcast". He said: "[We recorded] just two songs. I won't say any more because I don't want to spoil the surprise for whenever it's gonna get broadcast, but [it was a] bit of fun. [We laid down] one of ours and a cover of somebody else's stuff." Back in January, DEF LEPPARD finally made its entire catalogue available for downloading and streaming. The British rock icons, who had been longtime holdouts to having the band's music available digitally, even went so far as to re-record their classic hits in note-for-note replications rather than cave to a deal that didn't serve them well. Now, the band's work — from its 1979 debut, "The Def Leppard E.P." through 2015's self-titled album — can all be found online. This past week, DEF LEPPARD guitarist Phil Collen left the JOURNEY tour to deal with a family emergency. Replacing him until he returns is TRIXTER's Steve Brown.